An undisputed master of Italian cooking and talent of Gambero Rosso Channel with his program "Il gusto di Igles", since 2018 Igles is the new Coordinator of the Scientific Committee at Gambero Rosso Academy. At the end of 2017, he moved to Rome for the opening of a new restaurant format at the Mercerie restaurant. Here he continues the promote the typical Italian products combined with research, experimentation and contamination with other cultures and their products, presenting a creative cuisine, rich in references to traditions but never ceases to amaze, provoke and evolve. Igles arrives at the national and international limelight between the eighties and nineties, as chef of the now legendary restaurant Il Trigabolo di Argenta, in the province of Ferrara. In the fourteen years, he led the kitchen brigade, which has produced many successful chefs, collects numerous awards, in addition to the two-stars assignment from the Michelin Guide, placing the Trigabolo among the first Italian restaurants of the period and contributing to the advancement of Italian cuisine with dishes considered today historic. In 1996 Igles moved a few kilometres to open his restaurant, La Locanda della Tamerice, immersed in the valleys of Ostellato. In the following fourteen years, he receives a Michelin star and consolidates his position as master of Italian cooking. From 2010 to 2017 he was the executive chef of the Atman restaurant, in the province of Pistoia, where his research work and passion for service led to receiving awards, including a new Michelin star. Igles is the author of eleven cookbooks, including the most recent "La caccia di Igles e dei suoi amici", and" Il Gusto di Igles". At the beginning of my career, when in the eighties I started working in the kitchen of the Trigabolo di Argenta, I was inspired by the chefs who had preceded me. First of all Nino Bergese, chef of the Italian aristocracy of the mid-twentieth century, and later chef of San Domenico di Imola and his heir Valentino Marcattilii, then the great Gualtiero Marchesi, to get to "compete" with colleagues like Gianfranco Vissani and other leading chefs of the period. Without neglecting the influence of intellectuals like Carlo Petrini, who reminded us that a dish to be good, as well as being cooked well, must also be clean and fair, and Luigi Veronelli is the central figure in the promotion of Italian food and wine heritage. 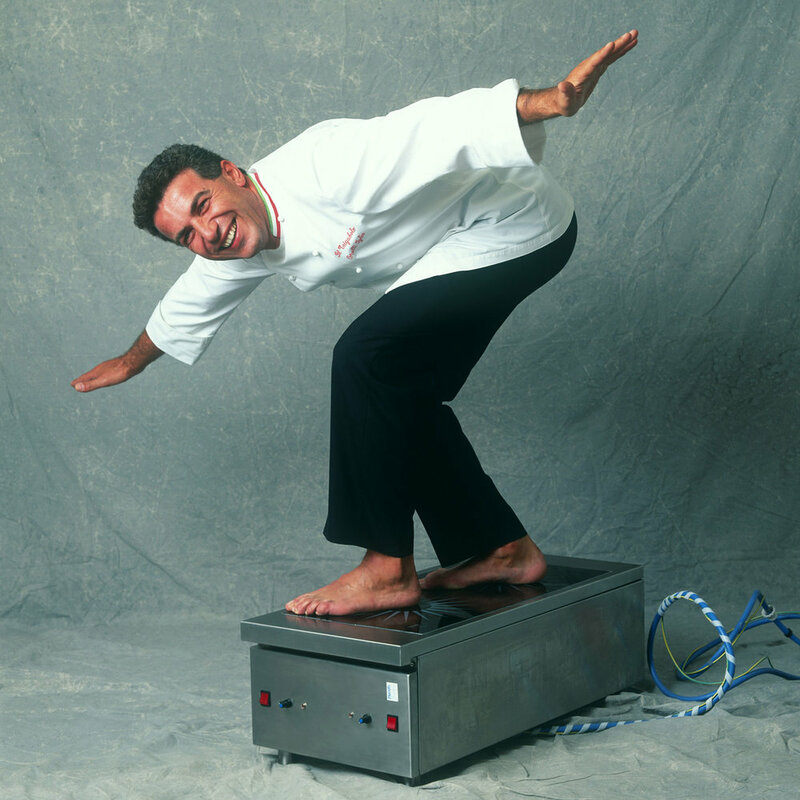 At the end of the eighties, experimentation in professional kitchens began a dramatic acceleration. Among the first in Italy, I discovered the Pacoject, a revolutionary and cutting-edge machine for the times, then the vacuum, not only used for storage but also for cooking, distillers, smokers and ultrasounds, just to name a few. A rapid and unstoppable evolution expressed in various forms, as in the work of Ferran Adrià, where the technique and morphosis become almost obsessive, or with Heston Blumenthal where the experience involves all the senses, or René Razpecki and the new Nordic Cuisine, where a collection of wild products becomes the focus of the kitchen. Over the years I have unwittingly acquired a rich collection of visual, olfactory, gustatory and sound memories. A collection enriched by meetings and readings, by mistakes and successes. A gastronomic memory that inevitably affects my approach to cooking today. How the products, cleaned, cut, preserved and cooked react to the various treatments and how they interact with each other, both from the organoleptic point of view, both from the aesthetic and socio-cultural point of view. The "cucina garibaldina", a term that I began to use in 2010, to describe my approach to cooking made of research of the best products that our beautiful country produces, a cuisine that precisely unites the whole of Italy. However, my cooking is always evolving and inevitably becomes more complex. Today my approach to a product, be it celery or a prawn is the same. I see the product as a complex entity, composed of various parts, sometimes clear and visible, others not immediately distinguishable. I use every part to get different preparations that can culminate in one dish or disperse in a multitude of different preparations. As happens in nature, nothing is neglected, thrown away, everything is transformed, through specialized and subsequent processes, into a multitude of other products. The whole process is cyclical, circular, from a complex entity, through successive transformations, we move on to a simplification that is nothing more than the starting point of new, more complex entities. The motion is circular, perpetual, which can evolve, taking different directions, always remaining circular. Here's what I mean when, with my playful style, I invite people to make a circle and say, all together: CIRCULAR KITCHEN!